People are good at seeing patterns in everyday life, even when no actual pattern exists. Suggesting a pattern to somebody will greatly improve the chances of them seeing it, even if it’s just one of many equally valid interpretations of what they are looking at. Think about when you see a pattern in the clouds. You can make somebody else see it much more easily if you tell them what they are looking at – a dog or a dragon, for example. 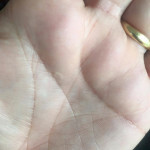 The creases on people’s palms have some connection to their development embryonically – and there are certain instances where genetic diseases can correlate with particular patterns of creases. However, it’s drawing a very long bow to suggest that the pattern of creases on a person’s palms would have any predictive effect on their life “success” – however success may be measured. Palm readers work in a similar manner to psychics and clairvoyants – usually picking up on little cues from a personal reading that gives the person the answers they’re expecting to hear. In Jon’s case, however, this statement relating to all people with the letter M on their non-dominant hand appears to be more akin to astrology. He has offered some generically positive predictions that are bound to make anyone feel good. The real test for these types of claims would be to see whether a particular pattern can be repeatedly and reliably matched up with a particular life outcome, without the palm reader knowing who the subjects are. This article has an interactive survey asking readers whether they have a distinctive M pattern on their hands. At the time the NZ Skeptics were asked to comment on the article, of those surveyed a whopping 83% can see the M. This is a pretty clear demonstration of the suggestive nature of this type of fortune telling. A mixture of an identifying feature that appears to fit most people, along with a set of predictions that make people feel good, will usually hit the mark for many and make them feel positive about the accuracy of a reading. One potentially dangerous aspect to this is that it encourages thinking that your life’s outcome is predetermined – that your life is in the hands of your genetics or fate. Even if most people find an “M” on their non-dominant hand, and are led to believe that they will have a successful future, what of those that can’t see the “M” who have a belief in palm reading? Will they walk away from this believing that their life going forward will not be successful? While the patterns on your palms may well be fascinating, it pays to be skeptical of claims that don’t have solid evidence of their worth, particularly when someone is asking for money in return for their service.